LOST IN THE RIBBON? – FORGOTTEN COMMAND? If you have made the switch to the ribbon (highly recommended) or you don’t know where to find a command or function in the ribbon, open the Application Menu (the big red A in the upper left). By default, there is a text box at the top of the Application Menu that is flashing (waiting for text to be entered). Type in the name of the known command BUT DON’T HIT ENTER (or the command will start). 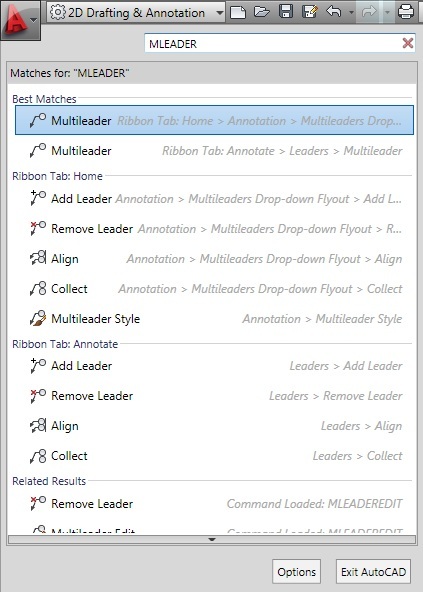 Under the text box, options will be shown concerning that command including where to find that command on the ribbon. If all that you can remember of a command is the first letter or two, enter the known letters in the command line then hit TAB repeatedly until you see the command that you want and hit <enter>. If you pass the command, hold down SHIFT, then hit TAB to go backwards.